There are a lot of threads in the forums complaining about the “anemic” look to Outlook’s Icons. These colorless icons are the new "Office look". While Office Insiders have had these icons for a few weeks, they are just now hitting more Office 365 subscribers. Judging from the complaints I’ve seen, many users are not happy. It took me a couple of weeks to get used to the new icons, especially the delete icon (the X is gone, replaced by a trash can), but I like them now, especially with the new Simplified ribbon (another feature that will probably generate complaints). Users will see new colors and scalable icons in the topline ribbon for Desktop (Windows) versions of the apps. These updates will show new modern icons that are simpler and more accessible, and a ribbon experience that highlights the rich collaboration features available in the Office apps. We began gradually rolling this out to Targeted Release organizations in late September. It will roll out to all Office 365 organizations over the course of the next few months, and we anticipate rollout completion by the end of the year. With the simplified ribbon, if you like to hide the ribbon can now have some buttons visible, without wasting a lot of screen space. If you prefer to keep the ribbon open, you can recover some of the screen space the full ribbon wastes. If you need to access the full ribbon, it’s one click away, using the V on the far right of the ribbon. I like the simplified ribbon - a lot. My only complaint is that it’s a separate ribbon and my customizations on the classic ribbon aren't on the simplified ribbon. I need to customize both ribbon to avoid the extra step to show the classic ribbon and find my customized commands. The folder list is a mess, in my opinion. 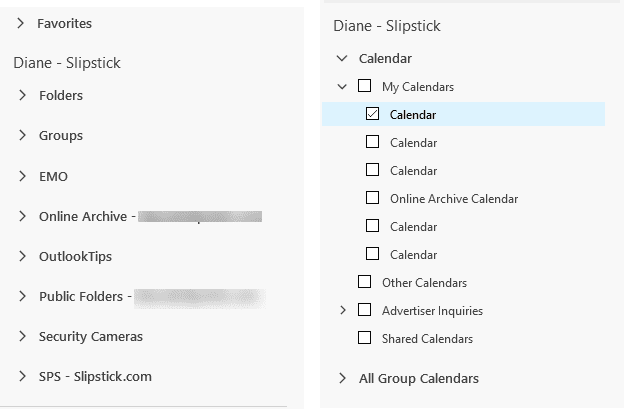 While I like having the shared mailboxes, public folders, and archive mailbox grouped with the owner mailbox, the calendar navigation pane is a mess because the mailbox name was removed from the folders. Where is the Out of Office command? it looks fat and stupid. the streamline robbon makes sense. the oversized buttons are a joke. I really like the simplified ribbon much better, and I had it for about 6 weeks and now it's gone. Is there a way to get it back? I just noticed - perhaps with the most recent office update I applied last week - that it's back to the classic ribbon.